I just realised that I never did post the recipe for this soup here. This is one of my recipes in the Masterchef Cookbook, and one that I make fairly often. The delicate sweetness of butternut squash is enhanced by the slightly spicy kick at the end, and the fresh chopped coriander adds a touch of bright flavour, and brings the soup together (see what I did there? I totally referenced JT and GW) I remember when I made it in the MC kitchen, I used a food processor to blend the soup. It ended up being chunky, so I panicked and sieved it, which made it too thin... one of the reasons I went out that year :-( I've never had the problem ever since though!! 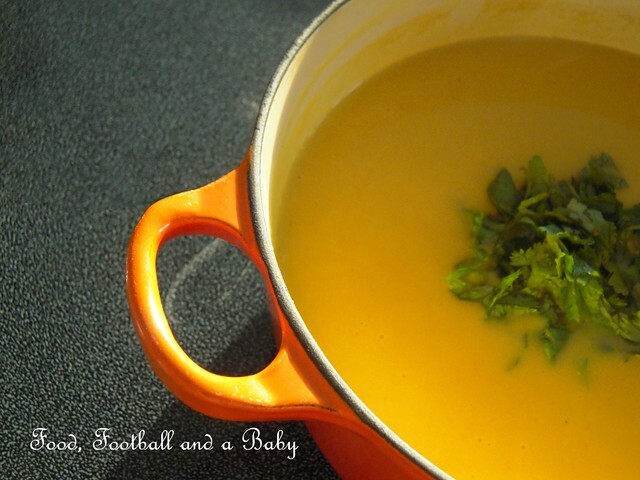 The squash for this recipe was grown in BC, so its fairly local. The fresh coriander comes from our new herb garden, and I am loving using all the herbs. I use a little bit of coconut milk to add richness to the soup, but you can skip it if you want a more intense squash flavour. Served with a hunk of French bread, this is a perfect light autumn meal. In a large pan, heat the olive oil, and toss in the onion and celery. Cook for around 2 minutes until the onion is soft, then stir in the ginger and garlic. Cook another minute, then add the cubed squash and the spices. Stir and fry for around 3 minutes or so, until the squash starts to fray around the edges. 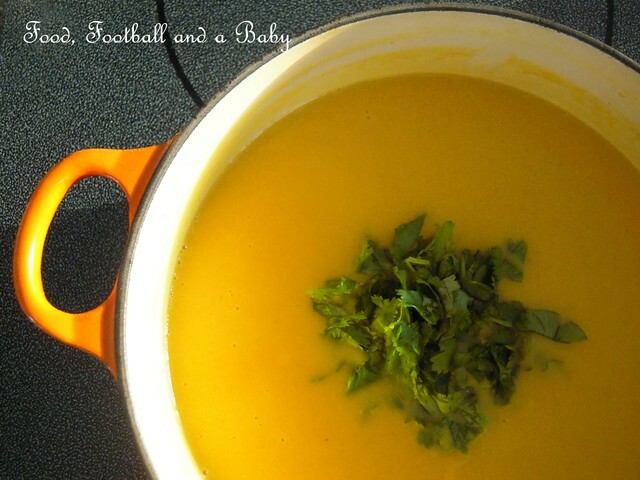 Pour in the hot stock and the coconut milk, bring to a boil and simmer until the squash is very soft. Transfer to a blender and blend till smooth. Season with the salt and pepper. Swirl in some fresh chopped coriander and some coconut milk to serve. I love all the flavours in the soup. And the colour just sings Autumn.